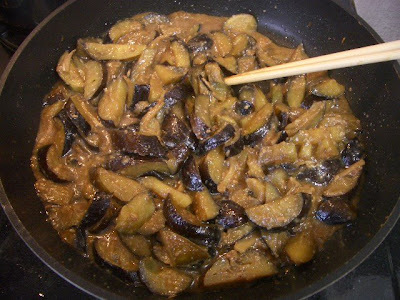 Nasu miso (eggplants panfried with miso and other seasonings) is a favorite of my wife’s. In fact, it’s one of her gohan no tomo (rice’s companion). The nasu miso shown in the photo contains ginger, too, and is seasoned with miso, sugar, and mirin.